Faculty hope the oven will be another way for the college to further blend the Sustainable Agriculture and Culinary Arts programs. 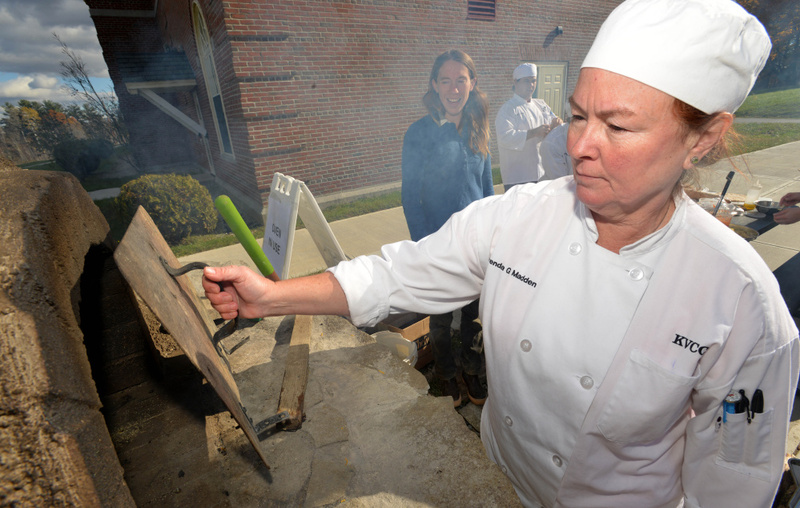 HINCKLEY — Smoke from the Kennebec Valley Community College’s new wood-fired oven billowed on the day’s cool breeze as culinary students used the oven for the first time to make pizza Friday morning. 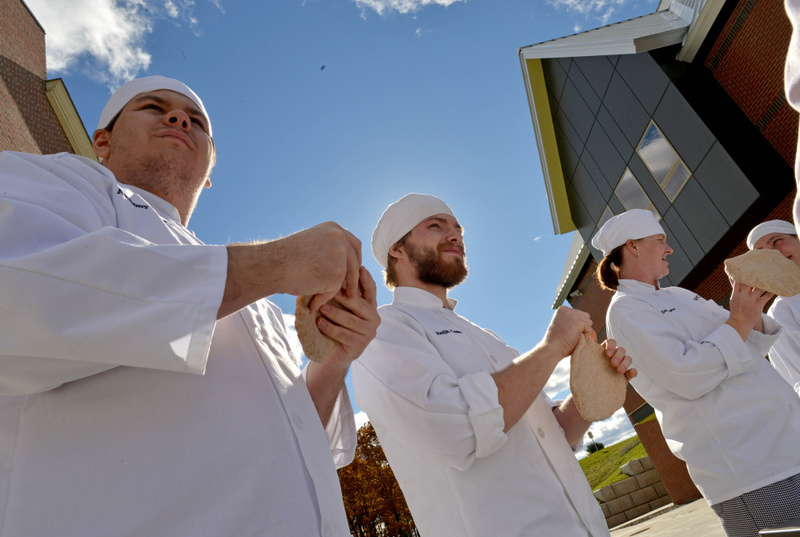 Students from chef Kelly Clarke’s American Regional Cuisine class gathered outside on the patio next to the campus’ Averill Building where the wood-fired oven is located. The oven was completed earlier this month using $3,000 from the Department of Labor Trade Adjustment Assistance Community College and Career Training grant that funded the college’s Sustainable Agriculture and Culinary Arts programs. The oven will be available to any department, program or person at the college who wants to use it. KVCC is the only community college in the state to have its own farm, and Creswell believes the oven will be a great opportunity to blend the Sustainable Agriculture and Culinary Arts programs. The wood-fired oven will be one more way the students in the two programs can further the campus’ farm-to-table initiative, in which the Sustainable Agriculture program grows and produces the ingredients that are used in the Culinary Arts program, including produce, meat, dairy and eggs. The pizzas were made using handmade 12-ounce balls of dough, tomato sauce that had been made using tomatoes and herbs from the campus farm, a mixture of cheeses prepared by Clarke, and an array of produce and meats for toppings — most of which were sourced from the Sustainable Agriculture program’s farm. Once the students tossed and topped their pizzas, the pies went into the 450-degree dome of the oven where they cooked for about three or four minutes until the crust was golden brown with a slight char and the cheese bubbled. The students, who are all seniors in the culinary program, made a variety of pizzas. One of the more adventurous pies was put together by student Michael Jackson, whose pizza featured sauerkraut, smoked bacon, a “sweet-heat” sauce, large slices of mozzarella cheese and a hot pepper garlic oil that he brushed onto the crust. Jackson had never used a wood-fired oven as a cooking tool before, but had been anxiously awaiting an opportunity to do so since he saw the construction of the campus oven begin. The oven can be used to cook almost anything, Creswell said. For pizza, the fire in the back of the oven stays lit during the cooking process with wood being added at intervals to keep it burning. For baking pie and bread and roasting meat or vegetables, the fire is used to bring the temperature of the oven to the right level for the type of food being cooked and is then put out before cooking begins. With access to this new cooking method, Clarke has a lot of ideas about what to do with it next. She planned to try cooking a 13-pound turkey in the oven later Friday afternoon and envisions being able to use the oven for a future bread class she has been wanting to start. “Several of my students want to be bakers so I would love to implement a baking program with an artisan bread course,” Clarke said. One of Clarke’s students, Victoria Brown, sees her culinary career taking her into the baking field. 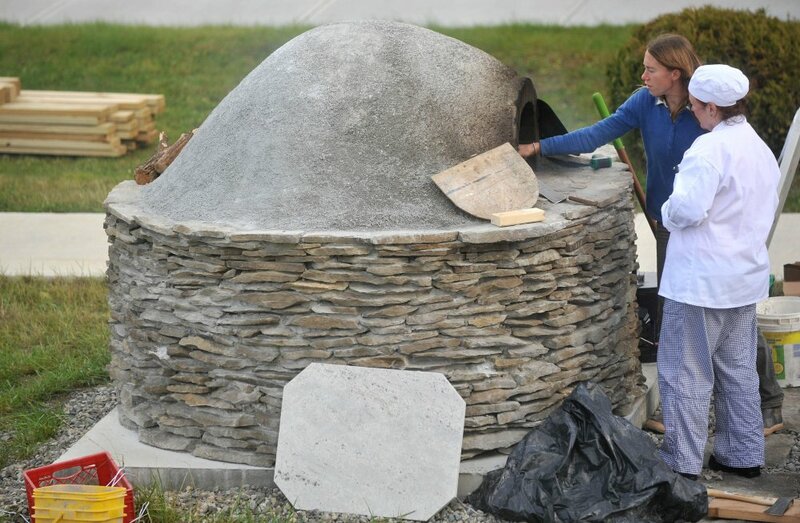 Brown said the campus oven is inspiring her to follow her own wood-fired dreams. In order to protect the stone and concrete oven from the elements, a protective structure is going to be built over it before snow falls.